Product news: The best Campaign editor we have ever built. Step-by-step explanation of pr.co's new Campaign editor, what changed, what is new and what stays the same. 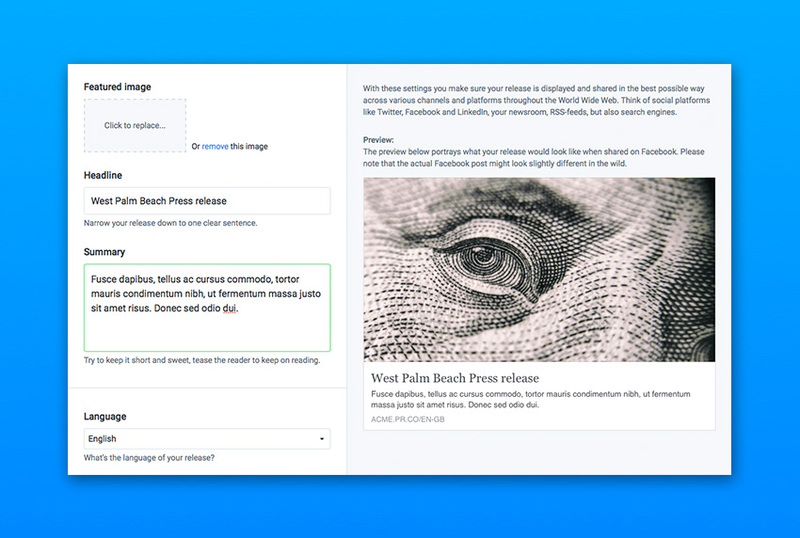 The new Campaign editor sets a new standard for pr.co, it makes the platform ready for our future plans, makes writing campaigns a lot faster and has a seamless collaboration experience. A lot of things have changed, there's some new features and some things are gone for good. This is a step-by-step guide through all the changes so that you can continue your work without any hassle. 1. The main navigation of the Campaign editor. This replaces the 'Optimise for web'-step and the 'Tags'-step. So it is now a combination of your headline, summary, language, tags, featured image, and other details. Optimise for web was unclear is some cases, so settings is the new name which is more straightforward and also should also cover future additions to this step. This replaces the 'Pulish date'-step and the 'Distributions'-step. This way you will have a better overview of your publish date and the timing of when your emails will be delivered. 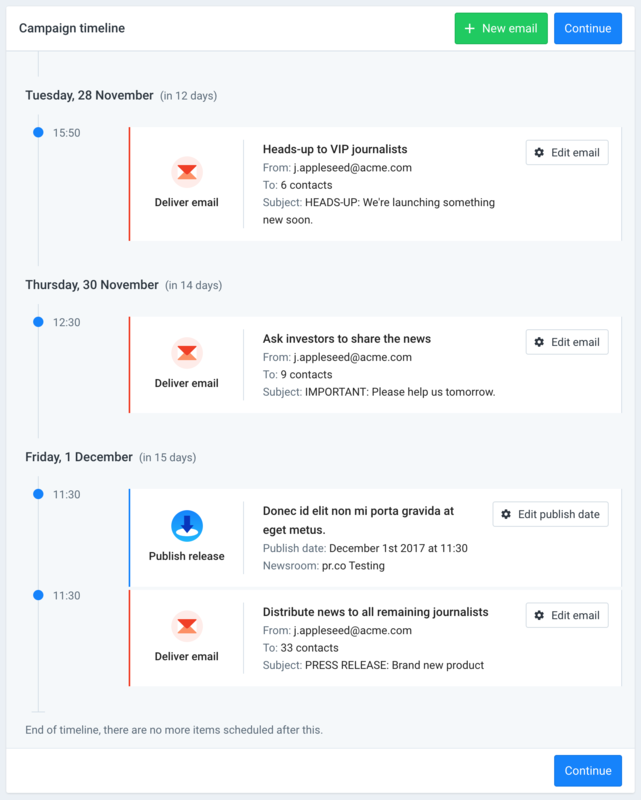 With this update also comes the ability to send emails on any desired point in time so the timeline step helps to keep things clear, for you, but also for colleagues who join later. The Timeline will also give you a live representation of the status of your campaign. So if it is running and the first email has been delivered, the system is currently sending a second email and there's two other items due, yo will see exactly that. Previously approvals would be available under the 'Ask for approval' button in the black topbar. From now on it will become a step in the process of writing a campaign. This nicely implies that it is a step you have to overcome before you confirm the campaign and keeps things clean during all the other steps. This replaces the 'Launch'-step. This is really a naming change because some people were confused with the 'launched' terminology as it implied that something would be sent-out straight away but you might have scheduled everything for the future. Confirm simply implies that everything you have set up will be confirmed for the system to start executing your campaign. The Campaign details tab gives you some meta information about the campaign you're currently looking at. 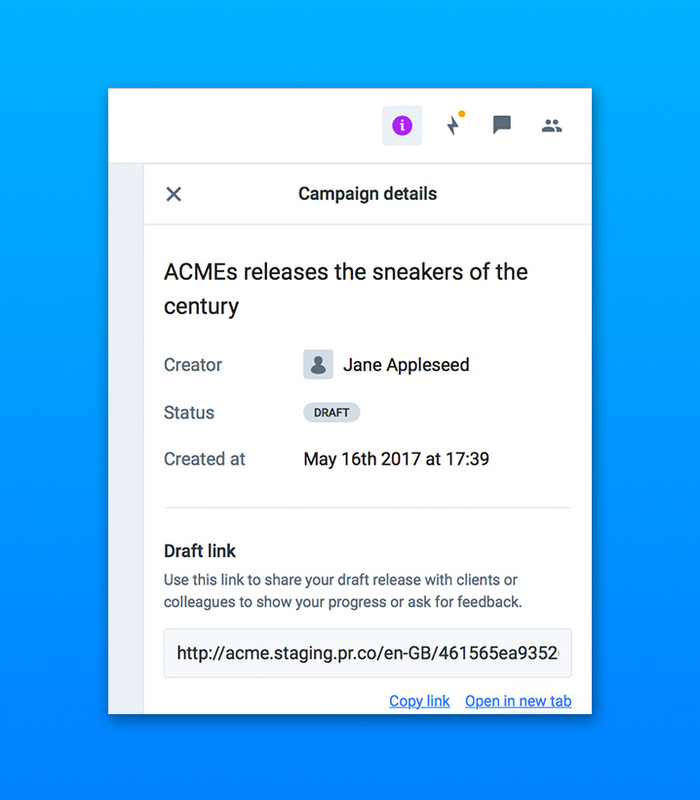 When it was created, who created it and a way to directly copy the draft- and public link to your clipboard. This tab is enabled for everyone. 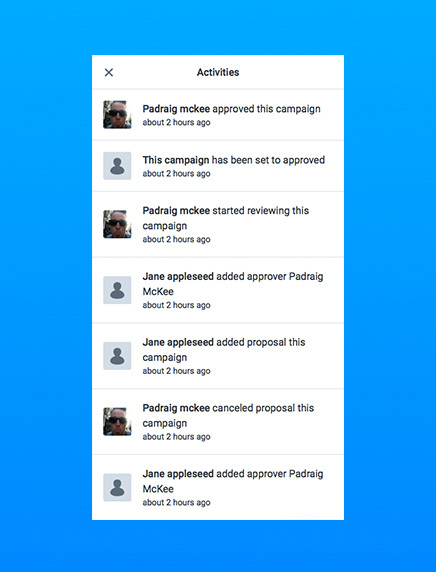 With Activities you can track what happend in the writing process of the campaign, when it happened and who it was that performed that particular action. This way you can always has the full story around a campaign, and know who is responsible for certain actions. If you'd like to notify one of the team members, you can start with an '@' symbol to display a pop-up of the names of each member. Click on their name and finish your message. When you leave a message with an @-mention inside of it, that particular user will receive that message as an email notification in their inbox. With the team tab you can manage which users you'd like to collaborate with on the campaign. 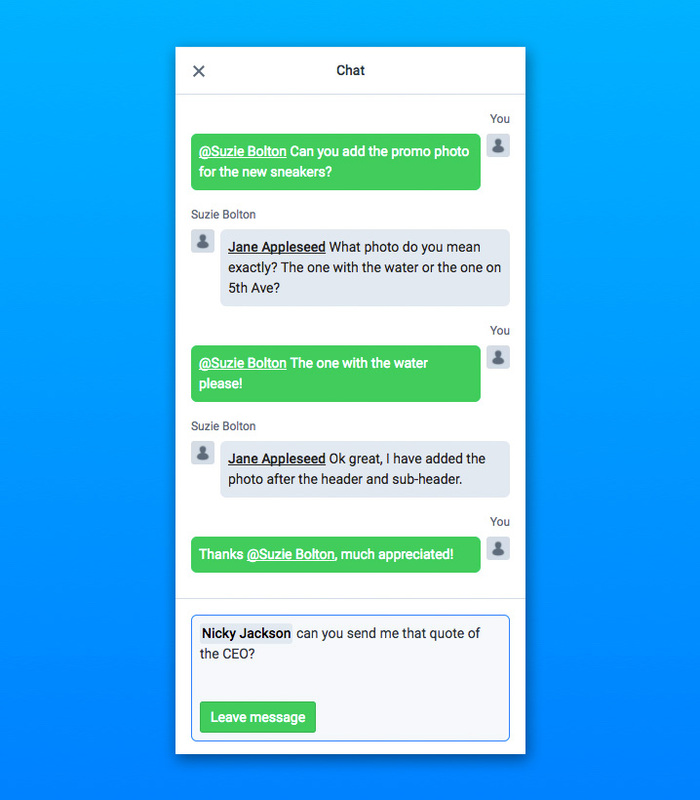 By clicking 'Add users' you can add them to the team and optionally leave them a personal message. This message will then be sent with the notification they they've been assigned to work with you on the campaign. This section is to go a little bit more into the details for the Timeline step. In the Timeline step you basically manage how and when your news will be spread to the world. 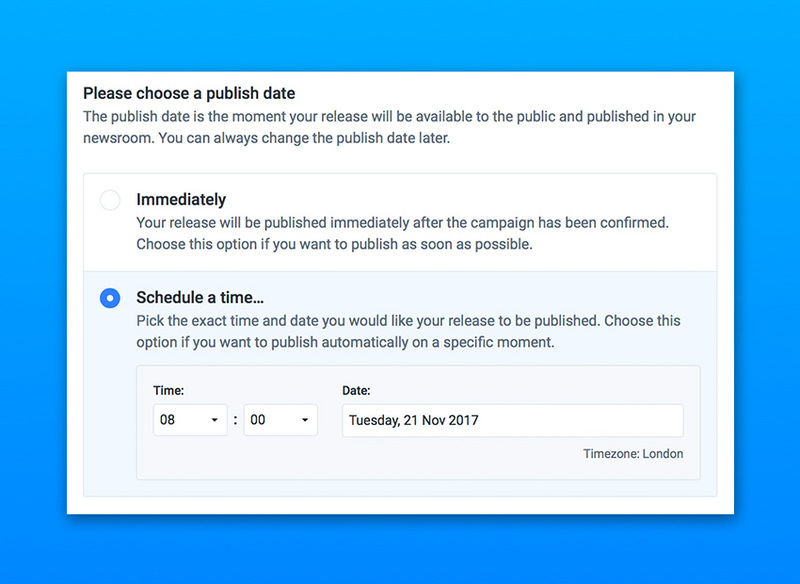 You start by choosing a publish date for your release, this is the starting point for your timeline so choose this date carefully. For example, if you release needs to go live on Tuesday morning you set this date at Tuesday morning for the time you'd like it go 'public'. Then, you start adding emails to drive traffic towards you newly published release. You can start adding emails as soon as you have chosen a publish date. Then, for each email you can choose when you'd like it to be delivered. By default this is the same time as the publish date, so for example Tuesday morning at 10am. You can also choose to send it at any other time (as long as it is in the future). Because of this we are introducing the Timeline step, so that you can keep an overview of all these communications touch points in one place. One last thing to mention about the timeline, the timeline will always be a live representation of your campaign. This means that when two emails were already sent-out, the system is currently sending another one and there's two items due; you will see exactly that as the status of the timeline. Two emails will be 'Delivered' and one 'Delivering', the others are 'Scheduled'. Then lastly, there's also a big change for people still using our old 'Classic editor'. We are discontinuing this editor with this update. All old campaigns are still backwards compatible you unfortunately you won't be able to create new classic campaigns. The reason for this is that maintaining the classic editor was costing us too much time while most people are using exclusively the freeform editor now.